OAKLAND, Calif. — The University of Rio Grande volleyball team snapped its six-match losing streak before dropping a tough five-set decision during Friday’s opening day of play at the Mills College Invitational. The RedStorm posted a 28-26, 25-14, 25-12 triumph over the host Cyclones in their first match of the day before falling to Simpson (Calilf.) University in the nightcap by scores of 25-17, 24-26, 25-23, 19-25, 15-9. In the win over Mills College, an NCAA Division III school, Rio Grande overcame 11 first set kills to end its losing slide. Freshman Taylor Carroll (Atlanta, GA) and Macy Roell (Farmersville, OH) led the RedStorm with nine kills each, while freshman Carly Shriver (Gallipolis, OH) and freshman Ryanne Stoffel (Englewood, OH) had 17 and 15 assists, respectively. Sophomore Katie Hemsley (Jackson, OH) added 19 digs to the winning effort, while senior Aleah Pelphrey (Piketon, OH) finished with 10 digs of her own. Sameenah Muhammad had six kills in the loss for the Cylcones (0-5), while Alexandra Fitzmaurice finished with 12 assists and Vivian Kang had a match-high 20 digs. The wrapup against Simpson – a member of the NAIA’s California Pacific Conference – proved to be a back-and-forth affair, with the two teams alternating set victories throughout. Rio Grande hurt its own cause against the Red Hakws with 25 attack errors and 15 reception errors. Pelphrey had a career-high 19 kills and a match-high 16 digs to lead the RedStorm in a losing cause, while Shriver and Stoffel finished with 29 and 13 assists, respectively. Stoffel also had a pair of service aces. Hemsley also had 16 digs, while freshman Victoria Jones (Washington Court House, OH) added 11 digs and freshman Abigail Grasso (Minford, OH) had four block assists. Sara Salmons had 11 kills and 13 assists to lead Simpson, while Mariah Chavez had 10 kills, 15 digs, four service aces and a pair of block assists in the winning effort. Madison Stouder had 16 assists and three service aces for the Red Hawks, while Cameron Wallace had nine kills, three blocks and three service aces. 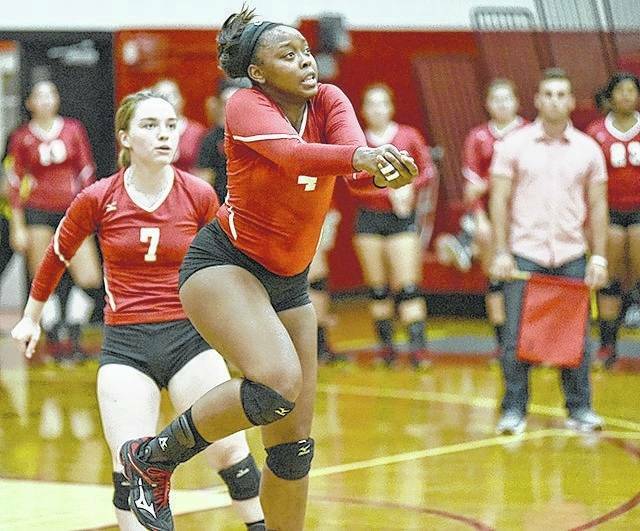 Rio Grande freshman Taylor Carroll had nine kills in Friday’s win over Mills College in Oakland, Calif. The win stopped a six-match losing slide for the RedStorm.